Last week, I conducted the iBuyer Intelligence Briefing — a conference call on the latest iBuyer news, trends and insights — with listeners from around the world. After the call, one particular question lingered: Which part of the industry controls the starting point of the real estate transaction, portals or iBuyers? Who has the advantage, and what are the implications for iBuyers? Zillow announced its Zillow Offers program in Phoenix earlier this year and started buying houses in May. It’s heavily promoting the program across its site. While looking in the Phoenix market, a prominent message is displayed on all active for sale listings. And if a visitor looks at an off-market listing (like their own home), this is the call-out at the top of the listing. That translates to about 1,600 offer requests per month. There’s a difference between an offer being requested and an offer being made. What’s clear, though, is that Zillow is generating a massive amount of offer requests each month, at volumes that rival (and exceed) Opendoor. The ultimate question is whether Zillow’s entry into the market is having an effect on Opendoor. Is Zillow soaking up demand from consumers, to the detriment of Opendoor? 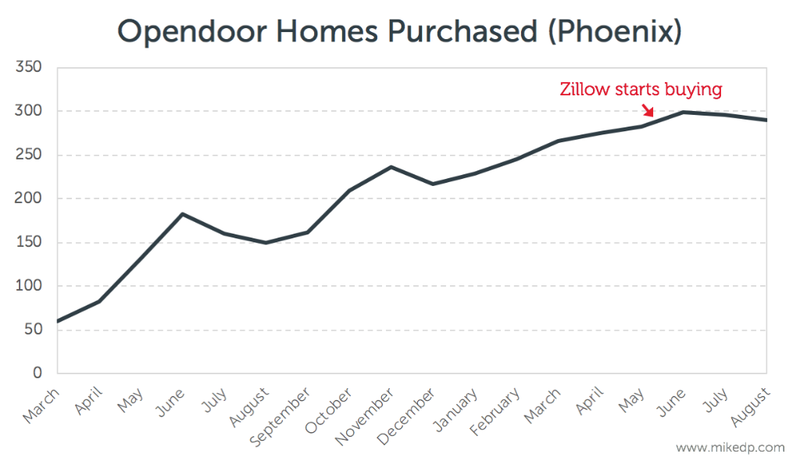 Zillow is having an effect on Opendoor’s traction in Phoenix by soaking up consumer demand. Opendoor is slowing its buying activity for other reasons (we’ve seen this before). 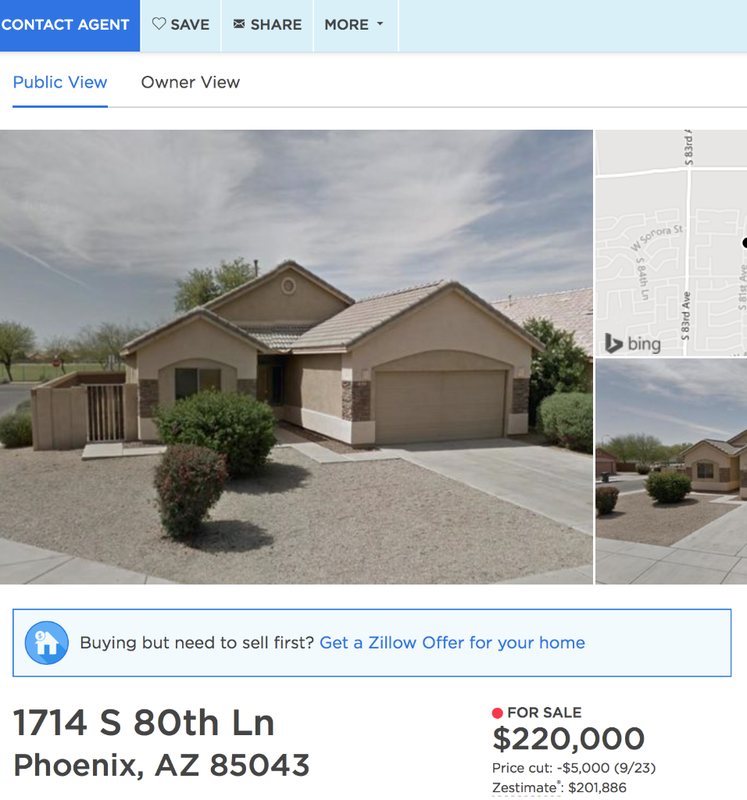 It’s too early to say if Zillow is having a direct effect on Opendoor’s business in Phoenix. Opendoor may slow its buying activity for a variety of other reasons, namely a potential market slowdown. But what’s clear is the leading position Zillow holds in the consumer journey and its massive reach give it a competitive advantage in acquiring customers — which has long-term consequences. Back in February, I wrote the following: “The most logical response from a major player such as Realogy or Keller Williams would be to launch their own iBuyer program.” Which is exactly what happened last week. More competition is coming to the market. As incumbents, portals, and other new entrants enter the iBuyer market, they have the potential to soak up consumer demand and adversely effect Opendoor’s business. But for Zillow in particular, the evidence is clear: Real estate portals are in pole position to capture consumer demand for iBuying services because they are at the start of the consumer journey. Will other global portals follow Zillow’s lead?